THIS SUMMER AT PRINCIPLE DANCE! Current Pathway students and those entering the Pathway Program in the Fall of 2019 are STRONGLY encouraged to attend! This intensive will build strength, artistry, and stamina while exposing dancers to new master teachers. Dancers will take ballet/pointe, jazz, contemporary modern, dance appreciation, and repertory classes. The workshop will culminate with a costumed performance at Principle Dance on the final day. Distinguished guest faculty! Teacher names and bios coming soon. *5 week session or option to purchase a 4-class punch card for your family! * Age by September 1st, 2019. $75 for 5 classes. Sat. 9:00-9:30 a.m.
$77.50 for 5 classes. Sat. 9:30-10:15 a.m.
$77.50 for 5 classes. Tues. 4:15-5:00 p.m.
$75 for 5 classes. Tues. 4:15-4:45 p.m.
**Must have a least one prior year of ballet of jazz. $66 for 4 classes. Th. 4:00-5:15 p.m.
$62 for 4 classes. Th. 5:15-6:00 p.m.
$80 for 5 classes. Tues. 6:30-7:30 p.m.
$80 for 5 classes. Tues. 5:30-6:30 p.m.
$62 for 4 classes. Th. 4:30-5:15 p.m.
$77.50 for 5 classes. Tues. 4:45-5:30 p.m.
Family Hip Hop: (7+ yrs) Parents are free! $62 for 4 classes. Th. 6:00-6:45 p.m.
$64 for 4 classes. Th. 6:45-7:45 p.m.
$64 for 4 classes. Th. 5:15-6:15 p.m.
$82.50 for 5 classes. Tues. 8:00-9:15 p.m. Adult Jazz: $80 for 5 classes. Tues 7:30-8:30 p.m. Adult Ballet: $80 for 5 classes. Wed. 5:30-6:30 p.m. 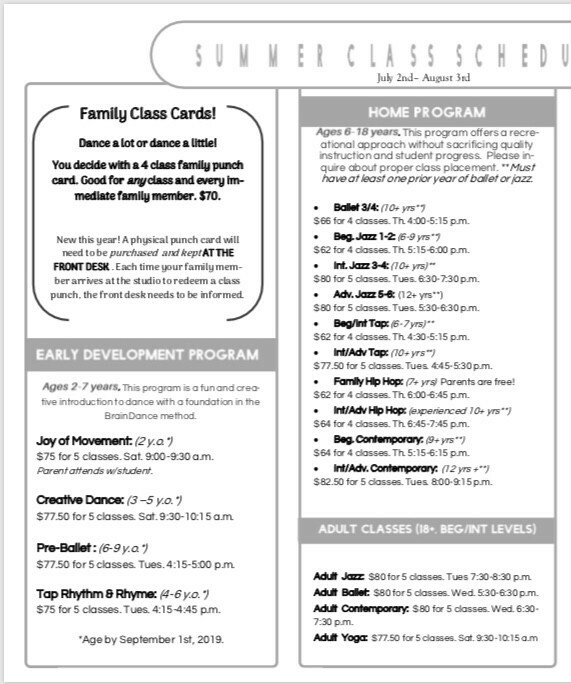 Adult Contemporary: $80 for 5 classes. Wed. 6:30-7:30 p.m.
$153 for 9 classes (both levels). No class Thursday July, 4th. 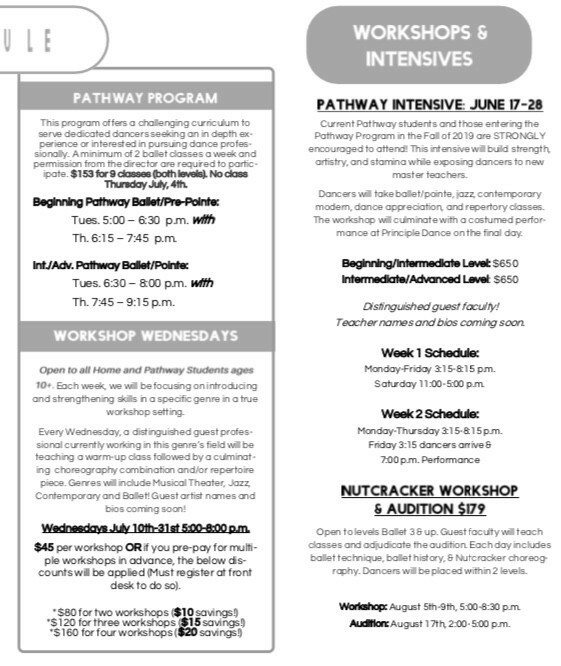 Beginning Pathway Ballet/Pre-Pointe: Tues. 5:00 – 6:30 p.m. with Th. 6:15 – 7:45 p.m.
Int./Adv. Pathway Ballet/Pointe: Tues. 6:30 – 8:00 p.m. with Th. 7:45 – 9:15 p.m.
Open to all Home and Pathway Students ages 10+. Each week, we will be focusing on introducing and strengthening skills in a specific genre in a true workshop setting. Every Wednesday, a distinguished guest professional currently working in this genre’s field will be teaching a warm-up class followed by a culminating choreography combination and/or repertoire piece. Genres will include Musical Theater, Jazz, Contemporary and Ballet! Guest artist names and bios coming soon. $45 per workshop OR if you pre-pay for multiple workshops in advance, the below discounts will be applied (Must register at front desk to do so). Open to levels Ballet 3 & up. Guest faculty will teach classes and adjudicate the audition. Each day includes ballet technique, ballet history, & Nutcracker choreography. Dancers will be placed within 2 levels. Workshop: August 5th-9th, 5:00-8:30 p.m.
Audition: August 17th, 2:00-5:00 p.m.